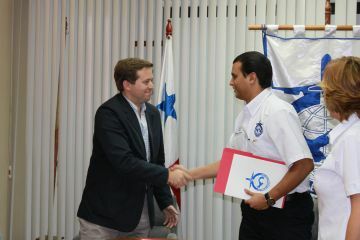 The Civil Aviation Authority (CAA) and Riva Real Estate Company, Industrial, Commercial, Finance and Agriculture (SAIICFA) signed the contract awarded to this company Argentina the study, design and construction of the extension of the Enrique Malek International Airport in David Province of Chiriqui. In the same were submitted by the Director of the AAC, Cap. Rafael Barcenas Chiari, the Deputy Director of the AAC, Lic. Sophia Cohen and on behalf of Riva SA, Mr. Gaston Felix German. Notably, the amount allocated for this project is 27 million 478 thousand 845 U.S. dollars, with which it seeks to bring tourism benefits to the country, providing an efficient and quality service to its users. Also with this construction is to accommodate the tourist boom, which every day takes hold in our country, both domestic and foreign, use these facilities to reach their destinations. The company won the tender Riva after submitting the lowest price and meet all the requirements and demands of the public procurement law, the SO and the addenda to the public event, according to the report dated May 3, 2010 presented by the verification commission. The national government displayed the aviation industry as an important point of development for the country, and will continue to work to improve airport infrastructure and thus contribute to the continued development of the country's tourist and commercial.